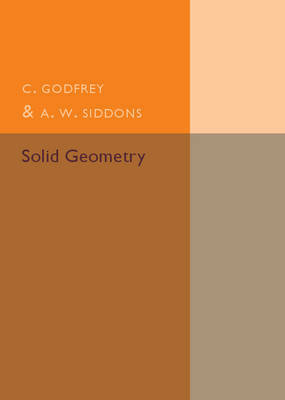 Author(s) Godfrey, C.; Siddons, A. W.
Originally published in 1911, this practical textbook of exercises was primarily aimed at school students and was intended to provide an accessible yet challenging 'informal course' on solid geometry for classwork, homework and revision. The book is divided into three principal sections: chapters 1-6 discuss the main properties of lines and planes, chapters 7-13 examine properties of the principal solid figures, including mensuration, whilst chapters 14-16 consider coordinates in three dimensions, plan, elevation and perspective, also known as descriptive geometry. The book covers key theorems, whilst cataloguing useful geometry questions focused on developing a broad understanding of the subject. Intended as educational rather than technical material and a practical, systematic supplement to school lessons, this book will be of great value to scholars of mathematics as well as to anyone with an interest in the history of education.